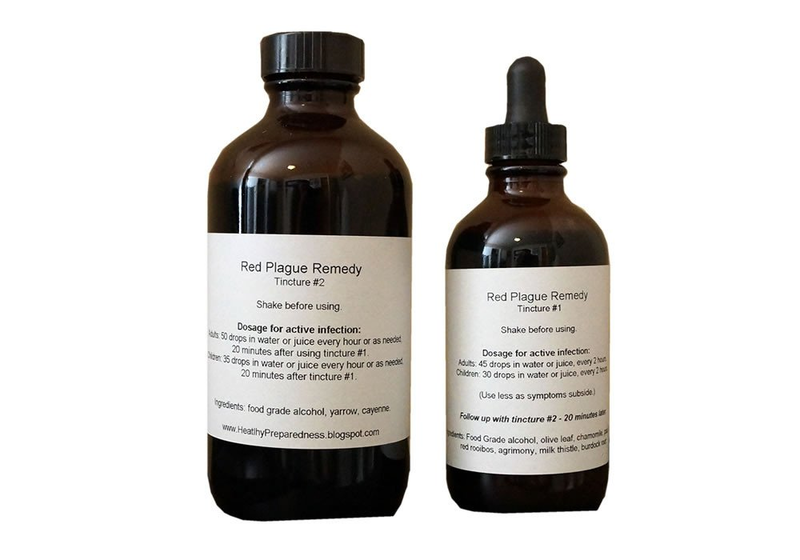 Here's the printable pdf containing the story behind the Red Plague Remedy and the recipe. How much does it cost to make the full recipe for 110 sets? Purchasing all of the ingredients will cost around $1100. The cost for each set would be around $11 per set. Is there a way to reduce the cost any? You can reduce the cost by making less OR you can also use quart jars to store the remedy instead of purchasing tincture jars. Just make sure to keep the quart jars in a dark place so light doesn't potentially reduce the efficacy of your remedy. When do I add the cayenne to the recipe? Add 1/2 tsp of cayenne into each of the yarrow jars. What's with the new moon cycle? Making the remedy from one new moon to the next are the instructions I was told to do. When making a tincture from one new moon to the next, it's said the the gravitational pull between that time frame helps to create a stronger remedy. Why do I need to blend up the herbs? This was another instruction given to me. I'm not certain why it's necessary. Maybe to "liven" up the herbs before tincturing them. Is using the reverse osmosis / UV light filtered water really necessary? This is what I was instructed to use. It's what we use when we make our remedy. If you can't find a place that sells that type of water, pray about what type of water you should use. Why do we need to set the herbs outside / by window for a day before pressing? I'm not sure about this one. This is what I was told to do. I question if the photons from the sun (whether it's cloudy outside or not) helps strengthen the tincture somehow. What if I miss shaking the jars for a day or more? All is not lost. Just make sure to shake the jars as often as possible. If you missed a day or more, consider shaking the jars two or three times on some days. What if I can't press and bottle the remedy until AFTER the new moon? I think that would be just fine. What's important is that the remedy has that one day where it sits outside, and it has steeped in the solution, within the jars, for at least that 4 week time period between one new moon to the next. Please leave a comment in the comment section below if there are any other topics I should clarify that would be helpful to others as they make the recipe. I know it should be simple, but if I do not have a dropper in my 8 oz. bottle, do I need to just have an extra 4 oz. dropper on hand to use with the second bottle? And it probably needs to be a 4 oz. not a 1 oz dropper because the amount of the dose would be different with a 1 oz. dropper. Am I thinking correctly? We use the same dropper for both bottles. I love you for sharing your story. You’ve helped so many people. A couple of years ago my little daughter was diagnosed with an autoimmune disease. Her face broke out with a rash when she was in the sun. After many doctors and a biopsy she was diagnosed with early stages of lupus. I prayed to Heavenly Father that if he could inspire a pioneer woman to heal her sons hip that was shot out at Hans Mill could he please inspire me to heal my little girls face. Very clearly in my mind I could see myself mixing equal parts of benonite clay and baking soda with tap water in my hand. I smoothed this paste on her rash and after three nights the rash was completely gone. She had no more problems. Heavenly Father loves his children and is anxious to bless us.